as a Great "Turnkey" Company! This website, BooksKidsLove.com, services the United States and APO/FPO addresses on U.S. Military bases overseas. 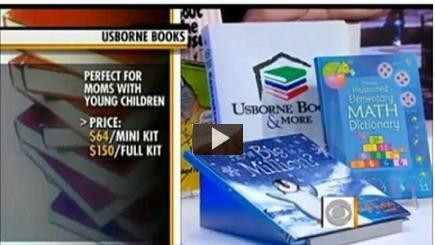 Usborne Books & More Featured on The Early Show on CBS! Recently, The Early Show on CBS did a news segment on turnkey businesses that are perfect for women who'd like to earn money with a home-based opportunity. What do they mean by "turnkey?" Essentially, a turnkey company is one that is already set up for you. The products and operations are in place - all the work is done, you're given everything to "turn the key" and get started right away. From over 200 Direct-Selling businesses that are members of the DSA (Direct Selling Association), The Early Show chose Usborne Books & More as one of the best companies for women who would like to earn income with a home-based business! If you love jewelry, Silpada is strong company. Do you love makeup? Mary Kay or Avon might be a good match for you. Is food your passion? Pampered Chef has great kitchen tools. If you enjoy high-fashion clothing, consider Etcetera. If you're interested in healthy cleaning products, Shaklee is a very reputable company. Each of those businesses was featured, in addition to Usborne Books & More. Why join Usborne Books & More? We have a product with PURPOSE...Books! Internationally acclaimed, award-winning and fun books, activity card packs and kits that parents, teachers - and best of all, kids - LOVE! What else sets us apart from other companies? Usborne Book & More has less than 9,000 active consultants nationally - there is no "saturation"
I'm proud to be a part of a company that not only made the list of best home businesses on the CBS Early Show, but is also dedicated to promoting the love of reading & learning - and offers ways for individuals, schools and organizations to earn the most amazing books for free. With Usborne Books & More, we make good money, set our own hours - with no sales requirements for consultants - while developing a great home library of the best books! Click here to go to the CBS Early Show website and read their entire news article on the best turnkey companies. Starter kit includes books, supplies & your own website! Your privacy is important! I do not sell or share your personal information with anyone else. If you have any questions, please email me at cherylbooks@gmail.com. 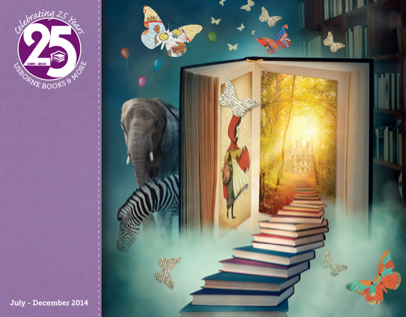 Website design/content - Copyright 2001-2014 Cheryl Simon, Usborne Books Independent Educational Consultant. Please do not copy. You may use the text on any of the www.BooksKidsLove.com pages for training purposes by printing it out or LINKING TO my pages. But please DO NOT COPY any portion of the text or layout, or unique graphics that you see here, to any other website. Visit ubah.com or edcpub.com to view text and images that UBAM consultants are permitted to copy to our own websites. Thank you! The words, "Usborne" and "Usborne Books," along with book covers, balloon logo and the Cartwright duck are Copyright of Usborne Publishing Ltd. All rights reserved. Usborne Publishing Ltd. has no connection with these pages and does not sponsor or support their content.